The spy who shot me is an Action and Adventure game for PC published by Retro Army Limited in 2019. A Casual Arcade game inspired by oldies but goldies! You have a mission on your hands, and it will lead you to literally drop into the White House, and visit the Caribbean. The spy who shot me™ is a comedy arcade-like FPS. Served up in a 90’s retro style. Take the roll of super spy Agent7! As he fights against the evil S.C.U.M. Your evening has been delightful so far. It started with a bang at the roulette table, where you won half a million quid. Then at the bar when you met this astonishing creature, the point of no return was reached, and you had to have her. You used all the tricks in your bag to seduce her and lure her to your exquisite apartment located in Belgrave, one of the poshest London suburbs. As do all real gentleman, you offer her a dance to your favorite song, “One Step Beyond,” and as both sets of lips were getting closer, madness occurs . . . Mother has just summoned you through your pager! (“What . . . mother?” asked the ravishing lady). Mother is my boss and I am 7, a super British agent and my next mission is . . . The Spy Who Shot Me! 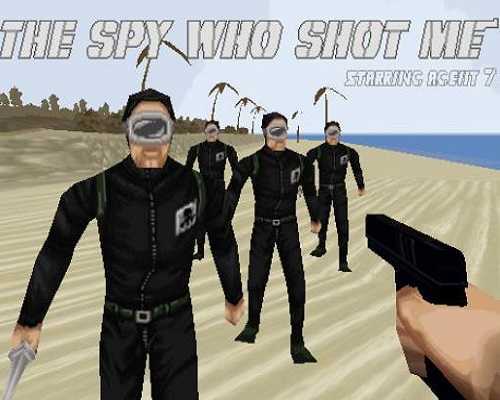 The Spy Who Shot Me is a 90’s retro first person shooter with fabulous humour. In this game, you’ll be playing the remarkable agent 7, who needs to recover three nuclear bombs from the evil organisation, S.C.U.M. 0 Comments ON " The spy who shot me Free PC Download "